Mix all together well outside after a rainstorm. Allow to marinate at least one hour. Bring preparation indoors. When we first moved out here, any time it rained, I would ban my poor daughter from playing outside until the mud dried. But alas, I, a born and bred city girl, was the mother of a true country girl. Staying inside all day was true torture of the worst kind for Bear. And when a toddler is confronted with torture, they are experts at handing it right back to you. On those days when she was denied the right to play in the great outdoors, I was subjected to the worst punishments from my dear, sweet, daughter. It was a vicious cycle. The confinement I imposed on her drove her crazy, her cabin fever drove me crazy. Something had to give. The following year, after Lizard was born, was the great drought of 2011. Mud…well, it wasn’t so much of a problem. There were plenty of other problems…failed crops, the struggle to find and buy hay, and wild fires, to name a few. But we didn’t have to deal with mud. With all those other things to worry about, I forgot all about mud. Eventually, rain came again. And as usual, in Texas, when a drought finally breaks, it does so in dramatic fashion. There were tornadoes and over nine inches of rain in one night. It continued raining for the next couple of days, though not as torrentially as it had that first night. We were so grateful for the rain, that all of us were out in it, playing in it and getting all wet. By the end of the day, Bear was covered in mud from head to toe…and she was loving it! A lot has changed since then. Instead of 2 children and 2 dogs worth of mud, there are now 4 children and 4 dogs. There’s also a husband, working in the garden, and in the pasture. He brings in all sorts of root vegetables…turnips, carrots, sweet potatoes. Guess what they’re all covered with? You got it…mud. There’s mud on the porch, mud on the floors, mud in the clothes, and mud in the sink. What’s a mother to do to keep her sanity? Well, here’s my few tips to deal with all the dirt. Have a designated set of clothes. If you have a certain set of clothes set aside for your kids to play in when its muddy outside, you will save yourself a lot of stress! These are the only clothes the kids are allowed to wear when it’s muddy. They can all be washed together, and you don’t have to worry about whether or not all the stains come out or not. We’ve been lucky enough to have a large set of well-used hand-me-downs from various donors to pick these outfits from. Once a shirt or pair of jeans gets a hole, it goes into the “mud clothes” stash. We also use my old t-shirts for this purpose. Incidentally, you can also use these designated clothes to bring peace of mind to other “messy” activities…like painting, for instance. Have a designated area for wet, muddy clothes. If you can contain it before it hits your floor, the wet, muddy things don’t make so much of a house-mess impact. This one is perhaps a little bit easier when you live in the middle of nowhere. My husband built a little rack that sits next to our front door on the front porch. When the kids come in wet and muddy, their clothes go on the rack, and they go straight to the shower. No questions asked, everyone knows what to do. It makes life a lot simpler. The clothes can go out to the washing machine straight from the front porch, and all that extra mud never has to even come inside the house. Carpet holds on to dirt and mud. We have tile throughout our entire house now, except one room (and the floor in that room is on the list for replacement). If you choose tile, choose a darker color for your grout…it won’t stain as badly (even when you seal it, it still will stain eventually). One of my biggest regrets about the way we finished out our house here originally was choosing to put carpet in the bedrooms. I had my reasons, but I have to admit, it was a mistake. You can always add throw rugs that can easily be washed on top of a hard flooring option. With 4 kids, living on a working farm, and 4 dogs…my life is going to be messy. There’s no getting around it. If it’s muddy outside, there’s going to be some mud on the floor. If the kids don’t track it in, my husband’s boots will (and to be honest, if mud is the worst thing I have to worry about on my husband’s boots, it’s a good day!). And the dogs are sure to have rolled in it before coming inside. If you come visit me, and it has been raining, my floors will be dirty. Just close your eyes, don’t look…and for goodness sake, don’t worry about your own shoes! Mud is always going to be part of life. Especially out here. There are some things in life worth worrying about. Mud just isn’t one of them. So, I’ll accept the fact that the dogs will track in dirt and deposit it all over the house. I’ll be grateful for that sink full of muddy vegetables for my family to eat. I’ll let my kids go outside and be mud magnets. I’ll let them have fun and be kids. We can clean it all up. I refuse to lose my sanity over it. I can’t speak as a mother yet, though I am sure that the muddy kids/pets/men is a nightmare, but I can speak as a kid. I’m now 21, but I tell you. 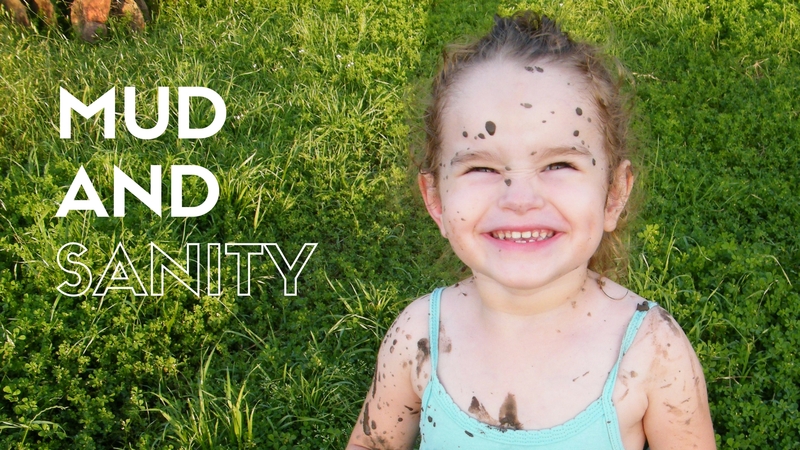 Some of my fondest childhood memories involve mud. I grew up on a goat farm with a beautiful stream running through it and long dirt roads… mud. That’s what all that equals. but I loved it. And I’m convinced it’s part of what has made me the care-free, fun-loving person I am today. I loved the fact that my mom let me jump in mud puddles and if I “fell” in the stream with my clothes on it was no biggie. I’m sure as a mom it can be tough but in my opinion it’s worth it. Thanks for stopping by! I’m glad you enjoyed the post. It sounds like you may have been a lot like my kiddos…they “fall” in the water quite a bit! They also wade in the pond to catch frogs and guppies. We go through a lot of rubber boots…and a lot of laundry detergent! This made me smile! Miss my littles…. Love the stories from the farm. Mud, and other things, on my boots and in my house never bothered your old “aunt” Shannon. I considered it the signs of a life well lived. Miss you, girl.